The latest spy images of the upcoming Cadillac ATS rear-wheel-drive sport sedan reveal more clues to its overall styling. 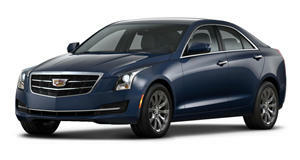 We&apos;ve known for quite a while that Cadillac has been working on their much-anticipated BMW 3-Series fighter, the ATS. Whether this will be the final production name is still not fully certain, but Cadillac is promising that their entry-level sport sedan will be world class in every way. Just last month the American luxury automaker released their first teaser image of the rear-wheel-drive sedan. These are so far perhaps the most revealing spy shots we&apos;ve seen yet, as the overall shape of the car is clearly visible. We can also make out its basic front-end design and the taillight styling makes it clearly a Cadillac. Overall, it looks like a more compact version of its larger CTS sibling. Power will come from a turbocharged four-cylinder and there will likely be an optional twin-turbo V6. A V8 is unlikely. Cadillac is hoping for the ATS to become a best-seller not only in the U.S, but in other world markets such as Europe and China. An official unveiling date hasn&apos;t been announced, but we&apos;re putting our cards on the Detroit Auto Show this January.